SKY MAP: The scene on March 23 at 9:30 pm local time from mid-northern latitudes. As darkness falls this week, the evening sky of early spring is dominated in the northeast by a very large constellation, Ursa Major, the Great Bear, and in the southeast by Leo, the Lion, containing the bluish-white 1st-magnitude star Regulus. And not too far to the west of Regulus, is a cream-colored "star" with a steady glow, shining nearly three times brighter than Regulus. But that "star" is, in reality, the ringed planet Saturn, now past opposition and favorably placed for viewing for much of the night. Ursa Major is indeed one of the largest constellations, but at one time there was a constellation in our spring sky that was even larger. It is the star pattern that the ancients made into the huge constellation of Argo Navis, the Ship, which currently occupies most of the sky down near the south and southwest horizon early evenings. But you'll be looking in vain for the name Argo on modern sky charts, for it officially passed out of existence in 1930, when the International Astronomical Union (IAU) defined the presently recognized constellations and their boundaries. The IAU broke Argo up into four separate parts: Puppis the Stern, Vela the Sails, Carina the Keel, and Pyxis the Mariner's Compass. The stars that comprise this last group actually belonged at one time to the non-defunct Malus the Mast [sky map]. Interestingly, in his classic star guide, "The Stars-A New Way to See Them" (Houghton-Mifflin Co., Boston), the late H.A. Rey kept Argo intact, referring to it simply as "The Ship," and describing it as "A large majestic group." Argo was regarded as a ship by several early civilizations and has often been thought of as Noah's Ark. About 5,000-years ago it appeared farther north than it does now, thanks to wobbling motion of the Earth on its axis known as precession. Ancient stargazers located in Greece and Asia Minor would see this celestial ship sailing westward-albeit stern first (Rey suggested that perhaps the ship was trying to correct an error in navigation)-and along the Mediterranean horizon as the night progressed. In Greek mythology the Argo carried Jason and his 50 Argonauts to Colchis at the eastern end of the Black Sea, to recover the Golden Fleece. The goddess Athena, who procured a magical oaken prow that had the powers of thought and speech that was thereby able to guide the crew, supervised the ship's construction. But at launching time, the vessel refused to slide into the water until Orpheus charmed it with his lyre, one of a number of feats he performed with that instrument (now commemorated in our summer sky by the constellation Lyra). In Carina, we find the brilliant yellow-white star, Canopus, the second brightest in the night sky, next to Sirius. 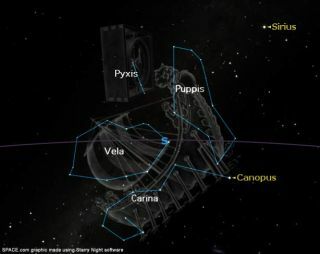 Skywatchers who live south of the equator may be well acquainted with four stars in this part of the sky-two belonging to Vela and two belonging to Carina-known collectively as the "False Cross." Not only do these four stars bear a superficial resemblance to the true Southern Cross (Crux), but, it is even oriented in roughly the same way though positioned farther to the north. Hence an uninitiated observer might easily mistake the False Cross for the true one, but only the latter points to the south celestial pole (matching the Pointers of the Big Dipper in this respect). Crux is also honored on the flags of such countries as Australia and New Zealand, and on numerous postage stamps. Yet the False Cross will have its time of glory 66 centuries from now, in the year 8600, when the pole will have precessed to a point just east of the cross-arms' intersection. By then, perhaps when our descendants are asked where the South Pole of the sky is located, all they need do is say "X" marks the spot!